for questions or comments about the functionality of this site. View documents posted by the author. Click the document then maximize the pop-up window for best viewing. Do not reproduce. 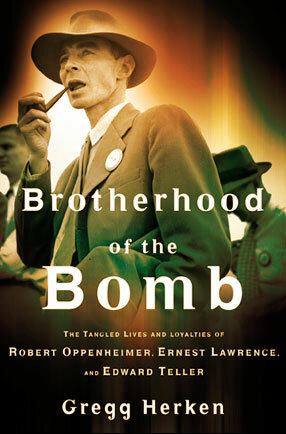 Since publication of Brotherhood of the Bomb two new documents have surfaced which support the book's conclusion that Robert Oppenheimer was a member of a so-called closed unit of the Communist Party's professional section in Berkeley, from 1938 to 1942. The first document is the unpublished journal of Barbara Chevalier, Haakon Chevalier's widow. Barbara died in July 2003, and my notes on her journal, which I read with her permission, appear below. New Evidence Document #1: Author's response to Kevles review, January 9, 2004. New Evidence Document #2: Excerpts from Barbara Chevalier's unpublished journal, "Robert Oppenheimer and Haakon Chevalier: From the Memoirs of Barbara Chevalier." New Evidence Document #3: Excerpts from Gordon Griffiths' unpublished memoir, "Venturing Outside the Ivory Tower: The Political Autobiography of a College Professor"
New Evidence Document #4: Author's Note: Is belonging to a "closed unit" in the CP tantamount to Communist Party membership? Chevalier to Oppenheimer, July 23, 1964, Robert Oppenheimer papers, Library of Congress Preparing his memoirs for publication, Haakon Chevalier notifies Oppenheimer that he plans to reveal that both were members of the same secret underground unit of the Communist Party's professional section from 1938 to 1942. Oppenheimer to Chevalier, Aug. 7, 1964, Robert Oppenheimer papers, Library of Congress In reply, Oppenheimer denies ever having been a member of a Communist Party unit. Transcript of 3/18/65 telephone call between Lloyd Garrison and Oppenheimer, Robert Oppenheimer papers, Library of Congress Oppenheimer discusses with Garrison, his attorney, the possibility of enjoining publication of Chevalier's book. Chevalier will ultimately describe the unit in his memoirs as simply "a discussion group." "Report to Our Colleagues," February 20, 1940, Bancroft Library, Univ. of Calif., Berkeley This is the first of two "Reports" that Chevalier claims he and Oppenheimer wrote and distributed while members of the Party's professional section in 1940. It is referred to in Documents 1 and 3. Chevalier to [name withheld], April 25, 1973, Haakon Chevalier papers, Valreas, France In response to a researcher's question, Chevalier identifies four of the eight members of the secret unit, all dead at the time of his letter. "Was Robert Oppenheimer a spy?" Merkulov to Beria, Oct. 2, 1944, excerpt from Sacred Secrets: How Soviet Intelligence Operations Changed American History by Jerrold and Leona Schecter, p. 316. Based upon information from NKVD agent Kheifets and CPUSA head Browder, Merkulov, the head of the NKVD, informs Beria, chairman of the Special Committee on the Atomic Bomb, that Oppenheimer has been cooperating with Soviet intelligence since 1942. Unidentified to Merkulov, Feb. 1944, reprinted in The Haunted Wood: Soviet Espionage in America: The Stalin Era by Allen Weinstein and Alexander Vassiliev, p. 184. An unidentified KGB agent reports to Merkulov that, while Oppenheimer has been "cultivated" by Soviet Army Intelligence since 1942, it is unknown whether the physicist has been recruited. If he has, the NKVD wants Oppenheimer turned over to them; if not, the NKVD intends to "begin his active cultivation." Analysis of the evidence by the author.